Annette, I had only seen the first line of the resignation letter in the press. It struck me as a little shallow at the time. Thanks for posting the whole thing. It casts a totally different perspective on the whole event. 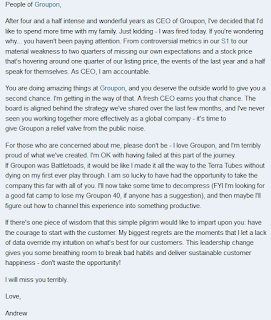 I suspect there are a number of group on employees who will follow Andrew to his next venture. Thanks, James, for your comment. It certainly does shed a different light on it all. I've heard from others today that they, too, were impressed after reading the entire letter. I wish him well and hope he goes on to do more great things. I'm really impressed by the letter, and by the fact that he was allowed to send it to staff and make it public. Most companies are too frightened of whatever they fear most to allow that freedom. 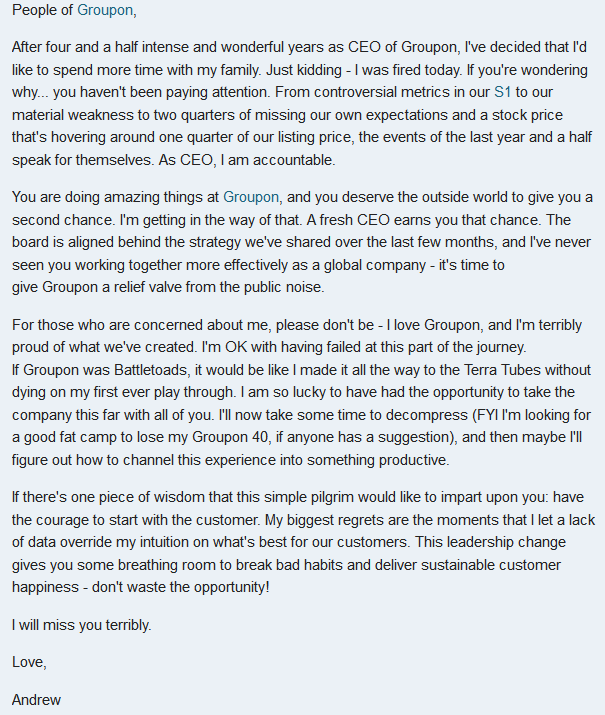 Makes me respect Groupon more. Thanks for publishing it all, Annette. I agree, Julia. Usually these letters find a back channel out; good for him for getting in front of it. I had only noticed this story in passing in the press this week and hadn't paid much attention to it. So, thank you for telling the story in detail. I think it's a beautiful letter full of humanity, honesty, humility, humour and insight (i wish I could have found a fifth that started with an 'h') with lessons for us all. Thanks, Adrian. I agree with your 4 Hs and 1 I. :-) All good lessons.